After studying the Oklahoma Academic Standards (OAS) reviews posted on the Oklahoma State Department of Education (OSDE) website, I produced a document that listed the consistent issues brought up by reviewers over the course of the four draft standards documents produced by the OAS writing teams. Here, I’m going to try and point to some ways in which these critiques could add up to ways in which the new OAS do not satisfy the Oklahoma Common Core Repeal Bill HB3399. 6. The subject matter standards for English Language Arts shall give Classic Literature and nonfiction literature equal consideration to other literature. In addition, emphasis shall be given to the study of complete works of literature. 7. At a minimum, the subject matter standards for mathematics shall require mastery of thee standard alogrithms in mathematics, which is the most logical, efficient way of solving a problem that consistently works, and for students to attain fluency in Euclidian geometry. 6. The new OAS violate number 6 simply because there are no text exemplars provided in the new standards documents so there is no way to know whether or not students are being exposed equally to fiction and non-fiction, or classical literature. Clearly, this section was added to prevent Common Core’s addiction to non-fictional (technical) texts from being overused on Oklahoma students. Clearly the legislature had an investment in this ideal enough to prescribe this specifically in law. Therefore, the OAS should provide text exemplars. 1.N.2.1 Represent and solve real-world and mathematical problems using addition and subtraction up to ten. 3.N.2.8 Use strategies and algorithms based on knowledge of place value, equality and properties of addition and multiplication to multiply a two-digit number by a one-digit number.4.N.1.3 Multiply 3-digit by 1-digit or a 2-digit by 2-digit whole numbers, using efficient and generalizable procedures and strategies, based on knowledge of place value, including but not limited to standard algorithms. No specific examples were given in the glossary, or within the standards themselves, describing any manner of method for instructing students in the standard. What are the standard algorithms in these cases? There are standards algorithms, yet the OAS does not prescribe them or provide examples of them as does this example found on HelpingWithMath.com. Nowhere does one find the only clear content that was in Common Core’s High School ELA Standards. Its standards required study of this country’s founding and seminal documents. Reviewers from the first OAS draft through the fourth complained of the lack of exemplars tied to the standards. 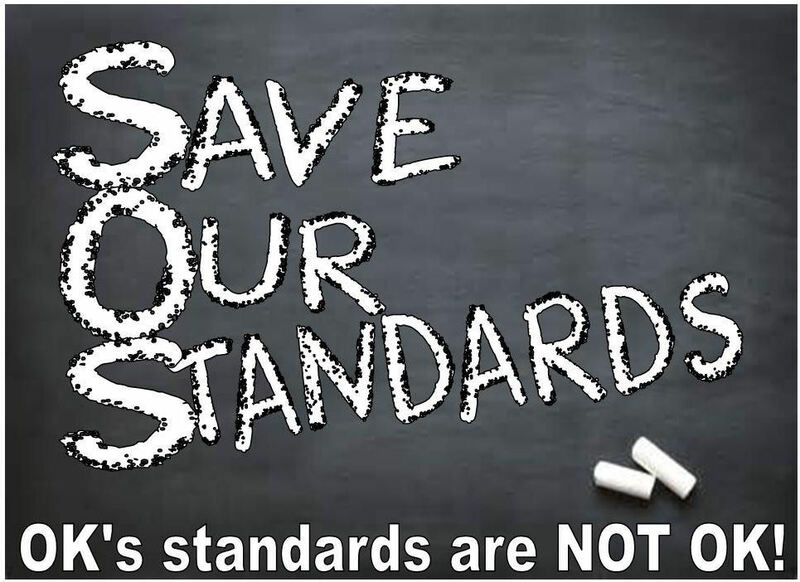 All subject matter standards and corresponding statewide student assessments adopted by the State Board of Education shall be carefully circumscribed to reflect direct application to subject matter proficiency and shall not include standards or assessment questions that are designed to collect or measure noncognitive, emotional or psychological characteristics, attributes or skills of students. Standards that are ‘vague’ or ‘untestable’ cannot be either “carefully circumscribed” nor are they capable of being declared as not being “designed to collect or measure…”. This review and critique of the new Oklahoma Academic Standards stems from no other desire than for Oklahoma to create the very BEST academic standards possible. Certainly, as I’ve said before, Oklahoma has the opportunity – using advice and assistance from top two education standards creators in the nation, and other prominent reviewers – to create the best NON-COMMON CORE standards in the entire nation. Oklahoma must avail ourselves of this ability and return the OAS to the OSDE where they can be revised. In fact, this is necessity if the new OAS are to comply with the full extent of HB3399.